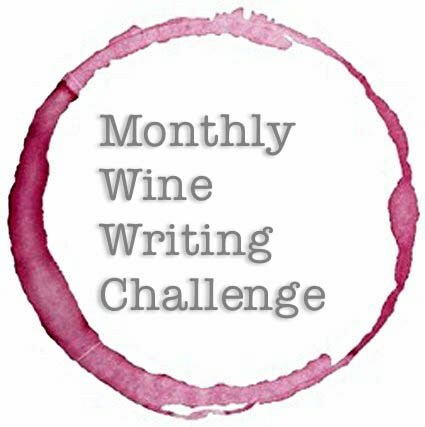 This is my first entry into the Monthly Wine Writers Challenge. What is #MWWC11? 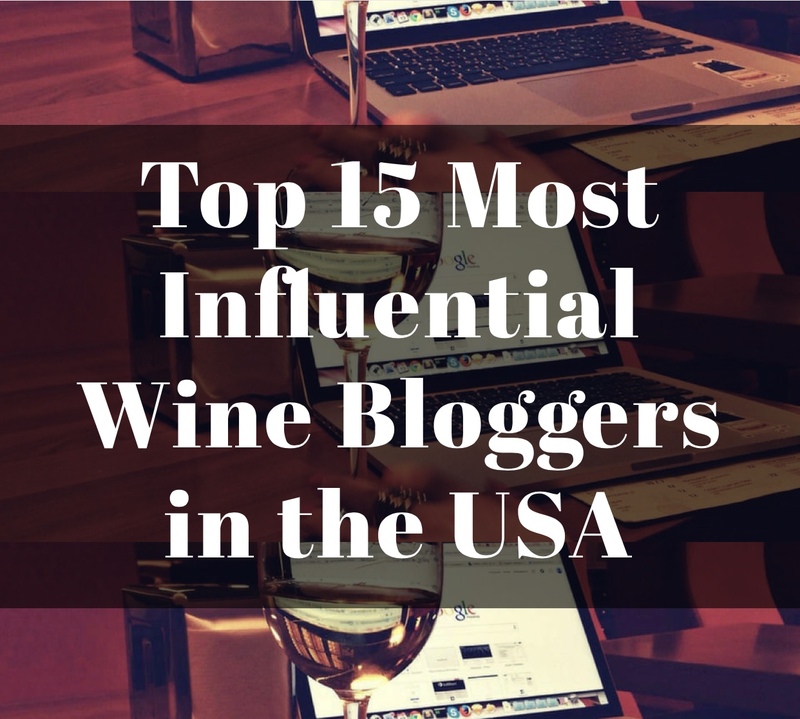 It was developed by The Drunken Cyclist in an effort to encourage creativity in wine blogs. This month represents the 11th month of the challenge. The first month was won by The Armchair Sommelier. Each month’s winner selects the topic for the following month. Last month’s winner Dracaena Winery selected the topic “friends.” As soon as I read the topic I knew it was a topic I could embrace. After all, wine is always better with friends. 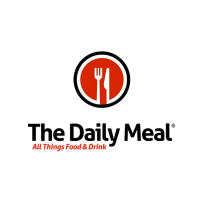 To learn more about the #MWWC11 visit The Drunken Cyclist’s post on July 16. Furthermore, each of the three blogs mentioned are each blogs you should be following! The evening of July 16, coincidentally the same date The Drunken Cyclist posted the new #MWWC11 topic, I had a planned Ladies Night Out at my house with a very special group of friends. 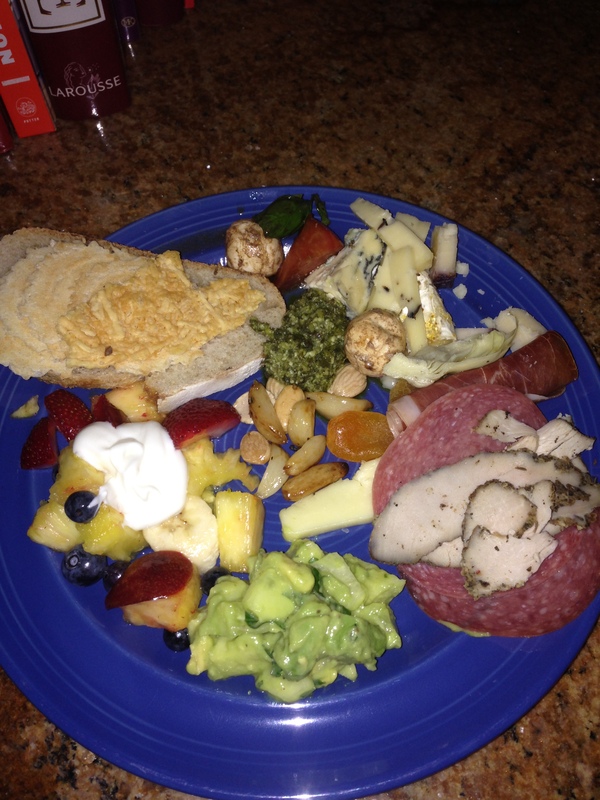 (See Friends, Food and French Wine…the Journey Continues post on 7/31/2014.) Though I had previously selected wine for the evening I decided to alter my wine plans to a great vineyard that would pair well with topic of friends and wine: Amici Cellars. The two wines I served from Amici Cellars were wines I had drank before and thoroughly enjoyed; however, something magical happens to wine when it is shared with friends. I believe the love and fellowship of good friends somehow alter the molecules of wine, making an already delicious wine truly exceptional! As expected we had a lovely evening of female fellowship, delicious food and outstanding wine! 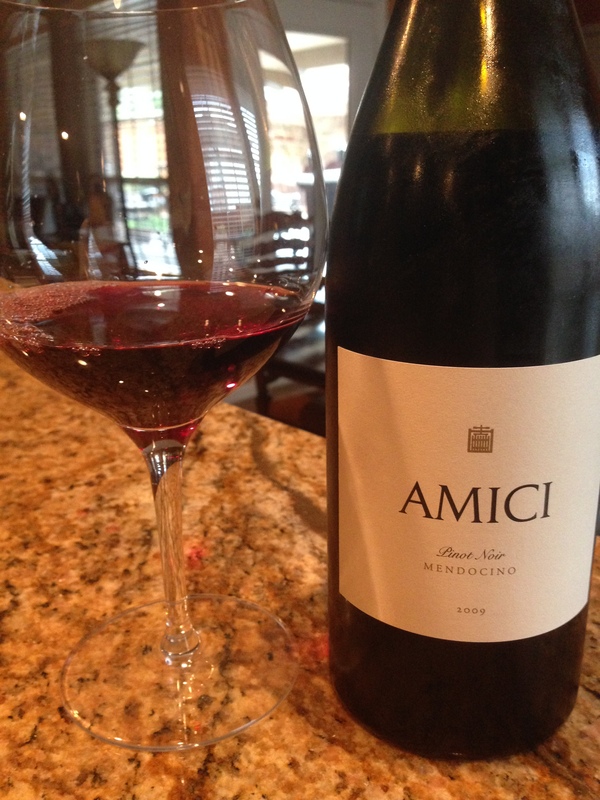 Amici Cellars 2009 Pinot Noir Mendocino: The ruby red 100% Pinot Noir wine was a Cabernet Sauvignon lovers Pinot! The inviting aromas of ripe fruit, spice and toasted oak tantalized the senses. On the palate this bold Pinot Noir fulfilled with flavors of dark cherries, ripe blackberries and plums; followed by well balanced baking spices, and oak. It was a lovely full body wine with nice viscosity, refined tannins and medium finish. This Pinot Noir was aged in 50% new French oak for 20-24 months and contained 14.8% alcohol. SRP $35. Though the alcohol content was high it did not over power the full flavor of the wine. I thoroughly enjoy full body Pinot Noirs and this wine fully delivered. Amici Cellars 2010 Cabernet Sauvignon Napa Valley: This deep garnet Cabernet was a blend of Cabernet Sauvignon grapes from Rutherford Bench (75%) and Yountville (25%), with a splash of Petit Verdot to complete the wine’s complexity. After an hour decant, this bold Cabernet brought forth aromas of dark fruit with a hint of licorice and coffee. 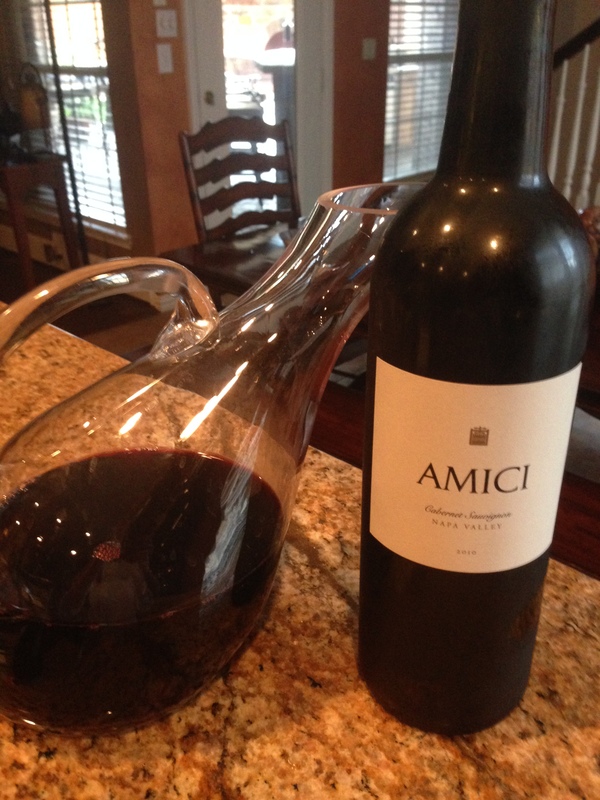 On the palate the 2010 Amici Cab fully delivered with crushed dark cherries, ripe blackberries and black plums; followed by anise, espresso, dark chocolate and wet tobacco. This was a rich, full body wine with ripe tannins and full acidity (which I love). SRP $45. This was a quintessential Napa Valley Cabernet Sauvignon and it was delicious. We paired both wines with an array of delicious foods and each wine met the challenge of pairing very well with our bounty. Our LNO feast included: Boar’s Head sliced Mesquite smoked turkey, Tuscan all natural turkey, sliced salami and prosciutto; fresh fruit salad with honey Greek yogurt, caprese salad, cucumber, jicama and avocado salad, roasted garlic, dried apricots, fresh country French bread, crackers and a variety of cheese that included: warm goat brie with fig preserves, triple cream blue cheese with honey, creamy havarti, Bellavitano Merlot cheese and an awesome creamy white cheese with truffles. For dessert we dined on Fresh Cheesecake and quinoa chocolate cake. 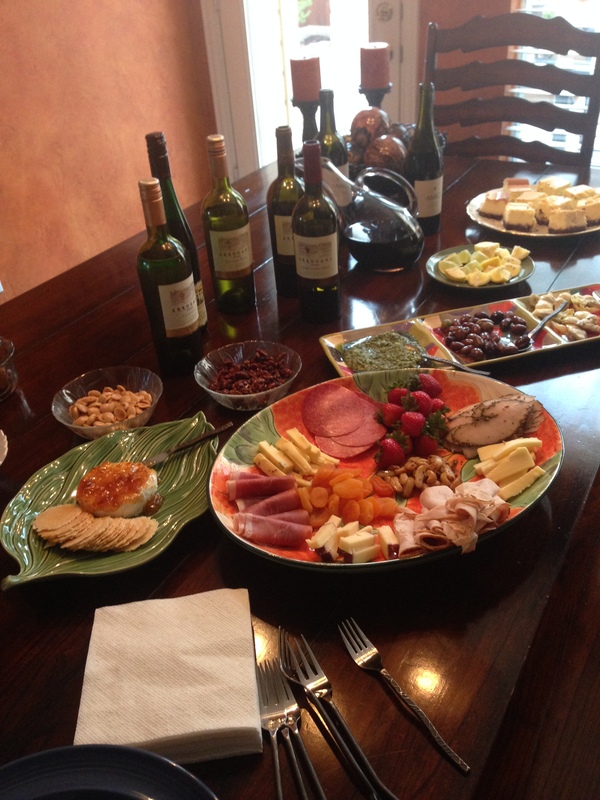 The spread was incredible and each wine worked through all of it! My Song Selection: The song I have chosen to pair with these two great wines from Amici Cellars and my wonderful night of female wine, food, fun and friendship is Count on Me by Bruno Mars. This is a great song of friendship! As Bruno Mars says friends are supposed to be able to count on each other. In the world of wine, Amici Cellars embodies this song. 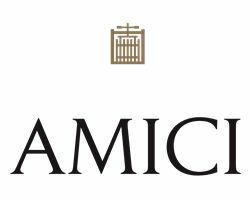 The group friends counted on each other enough to take their friendship into a business venture; that can be dangerous but for Amici Cellars the results have been GREAT! Furthermore, as friendships grow and evolve I know I can certainly count on my friend and I believe they know they can count on me. Yes, we love to drink wine and eat food together; however, the wine and food is always the back drop to the purpose of our LNO’s, which is friendship and love. Get your own bottles of Amici Cellars 2009 Pinot Noir Mendocino and Amici Cellars 2010 Cabernet Sauvignon Napa Valley, share with your friends, and let me know what song you would pair with them. Cheers! Next Burgundy Wine in Virginia: Absolutely! Sounds like you have some great friends and had a great night. 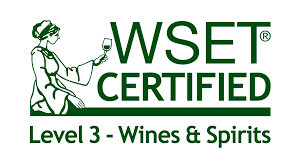 I completely agree with your comment, “love and fellowship of good friends somehow alter the molecules of wine, making an already delicious wine truly exceptional!” It amazes me how much the environment can have an impact on your impressions. Like how a certain smell can bring back a memory, being with friends can enhance the wine. Slainte! You selected an awesome topic. Wine and friends really are a perfect pairing. It’s fine to have a glass of wine alone but if it is awesome or terrible don’t you want to tell someone! Thanks for the topic. Cheers! Thank you! I love your idea of a “Bon Vivant Play Book!” It was a fun night for sure. And great wine too! Cheers! Really nice piece of writing and I LOVE the song pairing too, great work Michelle. Thank you Suzanne. Some post just write themselves. Cheers! What a fun blog post to read. You are so right: one of the wonderful mysteries to wine is that something magical happens when it’s shared with friends. 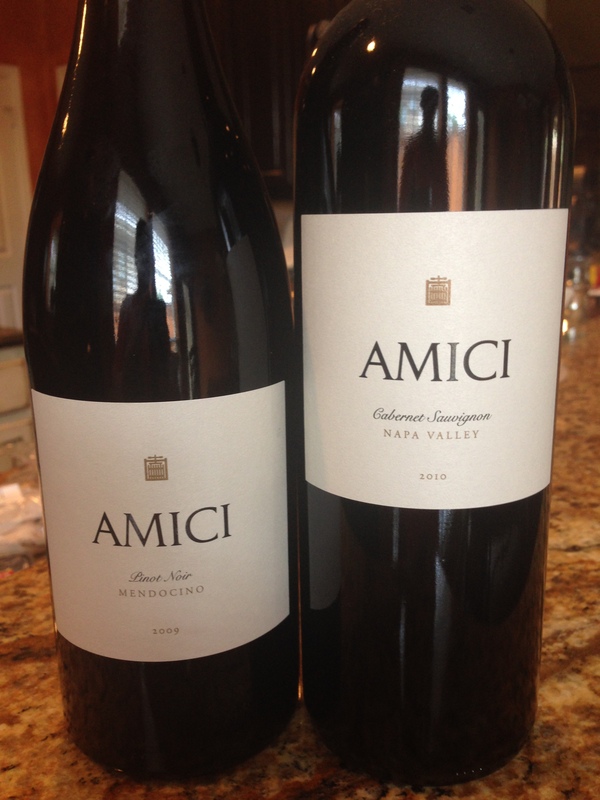 We’re so happy that Amici wines could be part of your fun LNO with your friends! Thank you. First of all I love your wine. Second, what better wine to paire with the topic of friends and to drink with friends than A wine crafted by friends. Cheers! 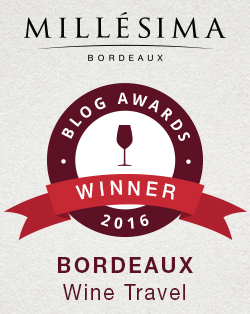 Welcome, and a fine article for your entry into our little “challenge.” Wine is best with a friend or friends. Thank you for your warm welcome. Hope you enjoy some good wine this weekend. Cheers!